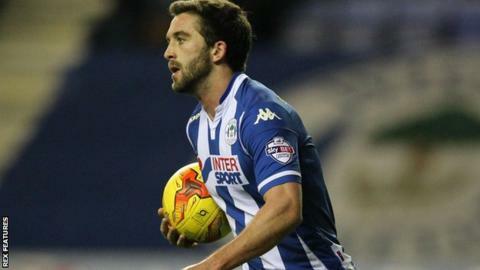 Wigan moved up to third in League One after victory at Sheffield United. Will Grigg gave the Latics a second-half lead from the penalty spot after Yanic Wildschut went down under a challenge from Chris Basham in the box. Debutant Conor McAleney got the second, five days after his loan move from Premier League side Everton. He fired a low drive past George Long, before Grigg missed a second penalty with 16 minutes, left after Chris McCann was tripped by Paul Coutts. "Coming to a big stadium like this in front of a big home crowd, we showed that we are a good football team. "We can play possession, we can cause you problems with that and once we get in front we're a real threat in the counter-attack. "Everything about the game, I was happy with. "There's obviously some areas that we can and will improve on but in terms of all-round performance, both attacking and defensively, I thought it was the best of the season." Match ends, Sheffield United 0, Wigan Athletic 2. Second Half ends, Sheffield United 0, Wigan Athletic 2. Yanic Wildschut (Wigan Athletic) wins a free kick on the right wing. Attempt blocked. Matt Done (Sheffield United) left footed shot from the centre of the box is blocked. Corner, Wigan Athletic. Conceded by Jay McEveley. Attempt missed. Che Adams (Sheffield United) right footed shot from outside the box misses to the right. Corner, Sheffield United. Conceded by Chris McCann. Jason Pearce (Wigan Athletic) wins a free kick on the right wing. Substitution, Wigan Athletic. Craig Davies replaces William Grigg. Substitution, Sheffield United. Jamal Campbell-Ryce replaces Jose Baxter. Penalty saved! William Grigg (Wigan Athletic) fails to capitalise on this great opportunity, right footed shot saved in the top left corner. Penalty conceded by Paul Coutts (Sheffield United) after a foul in the penalty area. Penalty Wigan Athletic. Chris McCann draws a foul in the penalty area. Attempt blocked. Reece Wabara (Wigan Athletic) right footed shot from outside the box is blocked. Substitution, Wigan Athletic. Reece Wabara replaces Conor McAleny. Substitution, Sheffield United. Matt Done replaces Chris Basham. Corner, Sheffield United. Conceded by Donervon Daniels. Attempt blocked. Billy Sharp (Sheffield United) right footed shot from the left side of the box is blocked. Attempt missed. Jose Baxter (Sheffield United) right footed shot from outside the box is too high. Attempt missed. Jay McEveley (Sheffield United) left footed shot from a difficult angle on the right is close, but misses to the right.